While Victoria Day is considered by many Canadians to be the unofficial start of summer, it’s July when most of us really hit vacation mode, with Canada Day to Labour Day being prime travel time. And whether we’re on a day trip just a couple of hours from home, or a cross-country journey to visit family and friends, craft beer events are an increasingly popular attraction for many travellers. For those planning to enjoy some beer tourism this summer, CBN and Expedia Canada are pleased to present this handy guide to notable beer festivals taking place across the country over the next couple of months, ranging from small and locally-focused tasting sessions to massive mega-fests with national and international scope. Last year’s inaugural edition of this festival received rave reviews for its picturesque location, great organization, and excellent selection of beer sourced exclusively from Ontario breweries. This year’s installment promises to be just as impressive, with 30 breweries and cider-makers from across the province lined up to attend, accompanied by some of the region’s best food trucks, a solid line-up of local music, and other attractions. Quebec’s third-largest beer festival attracts more than 70,000 people to Chicoutimi’s Old Port to sample hundreds of beers from close to 40 local, national and international breweries. Food from local restaurants, food trucks and other vendors is also available, and the four-day festival will be rounded out by live entertainment and a homebrewing competition. This event is unique not only due to its focus on cask-conditioned beers, but also because of its hyper-local geographic scope, will the spotlight being put on breweries from BC’s Lower Mainland outside of Vancouver. Attendees will enjoy 15 beer samples, a barbecue meal, and door prices – plus a special guest appearance by Delta BC’s Four Winds Brewing, winner of the Brewery of the Year honour at the 2015 Canadian Brewing Awards. 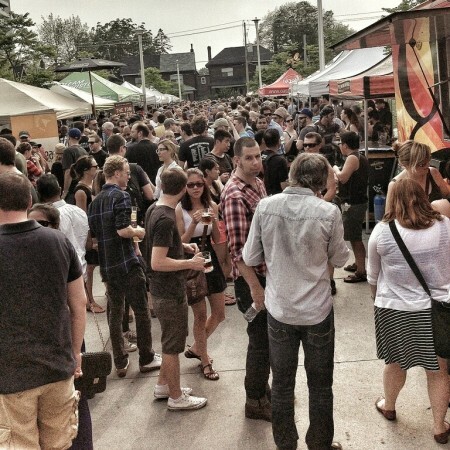 One of the largest and longest-running beer festivals in Canada, TFOB draws thousands of revellers to Exhibiton Place to choose from more than 300 brands of beer from over 60 breweries. Other notable attractions include the World of Beer pavilion – this year featuring beer, food and music from Ireland, including a number of breweries that have never been available in Canada before – live music on the Bandshell Stage, a wide array of food vendors and demonstrations, beer education sessions, and lots more. Nothing goes better with local beer than local food, and both are the focus of this annual event in Laval’s historic Vieux Sainte-Rose neighbourhood. Booths along Boulevard Ste-Rose will offer beer from Quebec breweries and food from local restaurants, with an emphasis on dishes that pair well with great beer. One of the highlights of year for Maritime beer lovers, the Seaport Beer Festival is the largest beer event in the region, with breweries and import agents offering more than 300 beers and ciders from over 100 producers. In addition to strong representation of local breweries, booths will be dedicated to brewers from other regions – including Ireland, Maine, Ontario and Quebec – and selections of cider, gluten-free beers and cask ales will also be offered. A few local food purveyors will also be on hand, and music will be provided by DJs and live artists throughout the sessions. Those interested in finding out more about where their beer – or more accurately, one of the main ingredients in their beer – comes from will want to check out this unique event, which may be the only beer festival in the country to take place in the middle of a hops field. A laid-back affair with a county fair vibe, the Shindig will feature a number of Ontario craft breweries – some possibly serving beer made with hops grown in that very field – along with tasty local food and acoustic live music. Co-presented by top Toronto beer destinations Indie Ale House and Bar Hop, this cruise around Toronto Harbour will focus on “one offs, collaboration brews & a few hard to find beers & ciders” from 8 local breweries and a cider-maker, plus food to complement the brews. Two sessions are available to choose from, giving attendees to option to enjoy the warm afternoon sun or the cool evening air. While it falls just outside of the traditional summer travel timeframe, it seems wrong to exclude an event called The Great Canadian Beer Festival from a list of notable summer beer events. Despite the name, the beer selection at the GCBF tends to focus strongly on BC breweries, although a few from elsewhere in Canada usually make the trip, along with a couple from across the border in the US Pacific Northwest. Beer-friendly food options such as pizza, tacos and BBQ will also be available. For more information on any of the festivals above, follow the included links – and don’t forget to check out CBN’s frequently updated list of upcoming beer festivals to help you plan your Canadian beer adventures this summer and beyond. And if you can’t make it to any of these festivals – or want to plan even more beer-related excursions – here are a few notable craft breweries across the globe that you can check out year-round.